It's Sunday once again, and you know what that means: it's time to share a photo of a complete-in-box copy of some video game or other. This week, I’m going with Jaleco’s Pizza Pop! 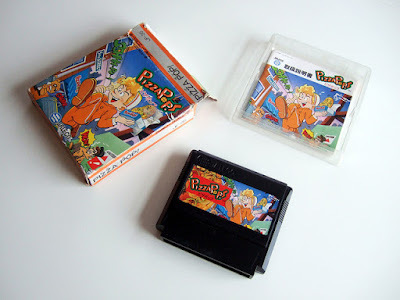 By most accounts, this Famicom title, released all the way back in 1992, is not a great game. Still, I've long been a fan of it due to its colorful graphics and old-school platforming gameplay. OK, so it's also due to this import's vivacious packaging, which is on full display in the snapshot above. Want to learn more about Pizza Pop! or see more photos of its box, cartridge or instruction manual? Check out this old post of mine.